Overcoming shingles; not just coping becomes a burning desire when you get hit by this re-cycled childhood illness, chicken pox. I know that now from personal experience! Fortunately, I've been finding good advice, and think I've licked the problem. At least for now. Shingles is an inflammatory condition, caused by a virus known as varicella zoster, or VZV, which can lie dormant for 30-40 years in your nerve roots, after you've had a bout of chiicken pox, giving you some immunity over that time. However, it wears off eventually. Shingles is your second round of chicken pox, as an adult. Shingles can be dangerous for it can settle on different body parts, sometimes on the face, with little pustles, and can even make an eye blind. The shingles appear as almost transparent skin blisters, often following a line along a nerve path, and usually only on one side of your body, or the other. One in five people who get shingles will also get a deeper nerve pain, or neuralgia that can come and go for years afterward. It is wise to deal with a case of shingles quickly when it breaks out, to avoid it touching crucial parts like your eye. The sooner it is treated the sooner the pain will be relieved too. Mine was under my left arm-pit, and on the left shoulder blade/back. The second week, I got that deeper, nerve pain, and I've cleared that up too. I have personally found some herbal teas that help to ease away the itching surface blisters, and that deal with the neuralgia pain. But those teas will be another article some time. One of the subscribers to my monthly ezine, Bob Malone, wrote, upon hearing of my case of shingles, with a number of very helpful tips. I am glad to share them with you in case you are desperate for solutions to your shingles. 1. Drink Apple cider vinegar for shingles (the kind with the vinegar mother in it, usually found in health food stores), for fast relief. About one or two tablespoons of this vinegar in a cup of hot water first thing in the morning, and through the day. 2. Get Vitamin B-12 shots every day for 3 days to clear up them fast. (Side effect, your vision may be foggy for a week or so); if shots are not available take daily sublingual tabs of B12, as this supports nerve health. 3. Ultraviolet Blood Irradiation (UBI) will supercharge your immune system and stop shingles. 6. Massive doses of vitamin C can help, particularly if you can get ascorbic acid (IAA) intravenously. That will flood your cells with a strong remedy for inflammation. In one trial, 7 out of 8 patients treated with IAA were completely pain-free in two hours! This is something that Naturopathic doctors have known for years; that high doses of vitamin C can wipe out virtually any type of infection. (Nutrition and Healing). 1. if you had Chicken Pox when younger, the virus (varicella zoster, or VZV) can lie dormant in your nerve roots. Childhood chicken pox gives you an immunity to the virus that causes chicken pox and shingles, but it often wears off after about 30 to 40 years. (source: Dr. Bruce West)). Note: do not take Cortisone shots, as that can trigger shingles. 2. Take B-12 shots for 3 days in a row, to avoid shingles; if shots are not available take daily sublingual tabs of B12. 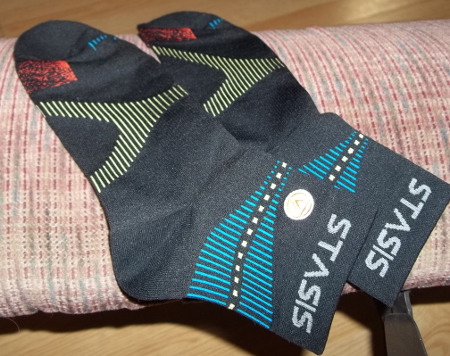 I've learned about socks for neuralgia, and ordered a pair to try out. I don't have a dramatic testimonial about how much they help, because I believe I had licked my case of shingles before that. However they do give me a sense of well-being and and make me more stable on my feet. Postherpetic neuralgia (post-hur-PET-ik noo-RAL-juh) is a complication of shingles, which is caused by the chickenpox (herpes zoster) virus. Postherpetic neuralgia affects nerve fibers and skin, causing burning pain that lasts long after the rash and blisters of shingles disappear. These socks have special fibres woven into them to accomplish through the soles of our feet the kind of subtle massage that a reflexologist does when working over your feet with their strong, moving thumbs and hands. That means they have some influence on your nervous system, including Neuralgia issues. The socks are produced by a new Canadian company after many years of research and development. 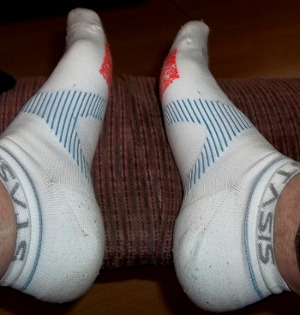 Already, testimonials are coming in as to how much those socks do for people with balance problems, or neuralgia pain, even diabetics find these to help with their blood circulation, athletes are finding more strength and stamina, people with MS are able to get around better, and some are giving up their walkers. It all sounds rather fantastic! But it is an affordable solution. Generally, $30-50 for a pair of socks. So I've signed up to sell the Voxx Socks for a commission. Now I can write about these wonder socks, and offer you a link for to order them. Voxx Life, has only been selling these products since July of last year. So not even a whole year in business, and sales are booming. In fact, the first week of May they are shutting down their website to build it bigger and larger - just so they can handle the sales that are coming from from around the globe! So the shopping cart will be closed until May 6. In the meantime, I suggest you click this link for my coded shopping cart and BOOKMARK it. https://voxxlife.com Then you can place your orders directly, starting on Saturday, May 6. You can also go see their testimonial videos on the Vimeo site. voxlife.com/?page_id=3675 I see there that athletes and seniors are taking to them like goldfish to water. They are seeing improvements in balance, stability, power, stamina, reaction time, pain relief, energy, recovery time, and posture. I know these Voxx socks are not aloe vera, nor handy herbs, but I do feel they fit in with my general goal of looking for safe, non-drug remedies for our better health. So you are likely to hear me rave about them again and again. And listen... I would love to get your stories of overcoming shingles! Feel free to use the ReachMe form.